When it comes to picking the right floor coating for your garage, you have several options to choose from. Among the most common for traditional garage usage is the decorative garage flooring look. However, another common choice is a traditional paint application. 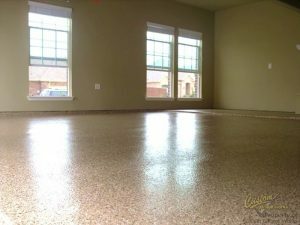 Garage floor painting in Haslet and Fort Worth, TX is not particularly common, as most high-quality garage floors are made with polyapspratic floor coatings. Here at Custom Garage Works, we specialize in premium garage solutions, including floor coatings and organization assistance. If you are interested in learning more about garage flooring options, give us a call at 214-494-9068 or 817-308-1305 today! 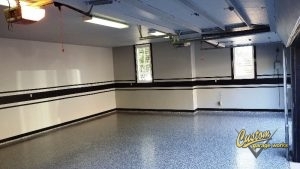 Many homeowners consider garage floor painting as an alternative to more reliable forms of concrete floor protection for two simple reasons: cost, and application. Big box home supply stores sell concrete and garage floor paint at fairly low prices, and from the can, you’d think the application is fairly straightforward. Some homeowners opt to paint it on like they would paint a wall, and others choose to acid etch their floor first. Neither of those situations is ideal, and we’re happy to explain why! You Can Expect Smoother, Longer-Lasting Results When You Choose A Higher Quality Coating. To begin, acid etching has the potential to destroy your concrete floor and is very bad for the environment. While you may be saving money in the long run by choosing to DIY your garage floors with acid etching and concrete paint, you’ll be costing yourself more down the line, and we’re not only talking about money. For all of the time and effort you will spend clearing out your garage and ‘prepping’ the concrete, you will still end up with a product that will flake and fall off within several months to a year of regular use. In order to make any substance stick to your concrete, proper preparation is required. That’s why before we apply our professional floor coatings, we grind down the concrete with a diamond grinding technique that ensures optimal adhesion. Additionally, paint just isn’t strong enough to make a good flooring material. Some garage floor paints are mixed with epoxy, but even then, you can’t expect it to last for too long. If you are interested in reliable garage flooring options, you should skip the paint aisle, and give us a call at 214-494-9068 or 817-308-1305. We have been providing professional solutions to residential garages since 2003, and we have the expertise and the experience to help you make the best choice for your garage, and your budget. We provide viable, affordable alternatives to garage floor painting in Haslet and Fort Worth, TX, as well as the surrounding areas. Don’t choose a coating that won’t last. With help from the professionals at Custom Garage Works, you can have the garage floor you’ve always wanted, and it will last for years to come! Updated on September 19, 2018 at 6:36 pm by Custom Garage Works.